Looking out over Italy’s majestic Lake Garda is Villa Calicantus, surrounded by just over a hectare of biodynamic vineyards. The whole scene seems a dream, but more than a dream it is a destiny. A wise sage once said, “It’s possible to try to avoid your destiny, but more often than not, it’s a waste of time.” For Daniele Delaini, born in 1981, his years spent travelling in Grand Tour fashion (like so many other young Europeans craved since the days of Goethe), surely wasn’t time wasted. In fact, it was his time abroad that matured him, like a grape waiting for harvest, to finally accept and embrace his destiny when the moment was ripe: plucked from the vine at a point of perfect readiness, not a moment too soon, or too late. To arrive at the point of accepting his destiny, Daniele first had to leave Calmasino, the town on the east coast of Lake Garda where he was born, and where the small villa which his grandfather Domenico modernized and put in a cellar in the 1920s would wait for him. The time came for Daniele to study Political Science in Padova. But his yearning for travel never ceased and he took every opportunity he could to explore the world during his University years. After his graduation, he continued to travel, always taking odd jobs to support his wanderlust (salesman, waiter, hotel work, selling wine, etc.). It took falling in love with a Parisian for Daniele to once more encounter fate. From 2007 to 2011 he took work in a French bank and through this lifestyle was introduced biodynamic wines. 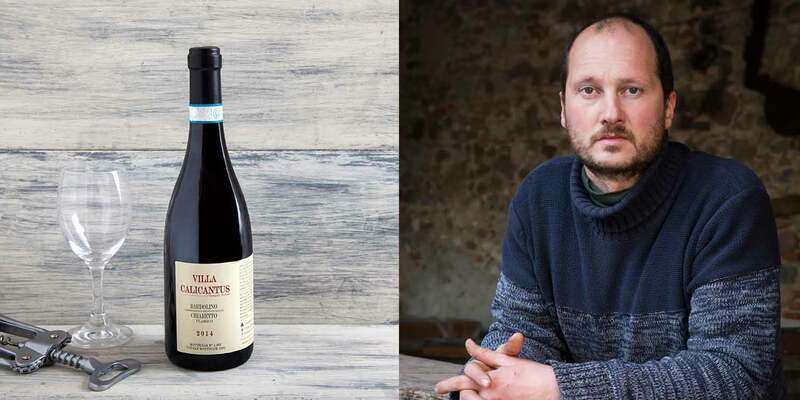 He fell in love with visiting cellars and producers, and became passionate about the live and wild taste of biodynamic wines—so vastly different from those conventional, static and traditional that he previously knew. It was there, among the French biodynamic vineyards and cellars, that destiny disguised itself in a cup of wine, and seduced him with memories of his home: the lake, the land, Bardolino wines—his lake, his land, his Bardolino wines. But little remained of his homeland as most of it was sold after the death of his grandfather. Only a hectare or so remained around Villa Calicantus. When Daniele returned in 2013, he came back with determination. He came back with the desire to be proud of Bardolino—with the goal of making well aged wines and to remake the Bardolino name into what it used to be, one of the most important wines in all of Europe. But above all, he came back with principles: respect the land, respect the grape. The respect for the land came naturally. Those lands were Daniele’s learned grounds. He failed. He tried again. He read books, he studied and he got to know other producers like him that had made the choice to be biodynamic. He realised that the rules of respect are few and the work is “more from the gut than from intellect.” If you believe that the vineyard is alive, its more instinctive to understand what to do and when. Rather than adding to the land, it’s about subtracting. And it’s not just respect for the land, but also an ability to wait—the classic art of the farmer since the times of Hesiod. And waiting pays off. Today Villa Calicantus, with its vineyards surrounded by forests and olive groves overlooking the lake from above, is the smallest winery of Bardolino, with a tiny annual production (from 4000 to 7000 bottles). says Daniele. “The wine must be alive to have a soul.” It’s exactly through that soul that his wines are recognised by drinkers, and life can be felt in each sip. And it is through that soul that Daniele consciously embraced his own destiny.